Lovely screen, strong features and decent looks; but is Samsung missing the point? First and foremost a wearable should be wearable. That's something you're going to be hearing a lot from us. If a smartwatch doesn't look great, then its features are going to need to be out of this world for you to choose it each morning over your designer, non-connected classic. So, while it's easy to get wowed by a powerful gadget like this one with a dual-core processor, 2MP camera and Super AMOLED display, you've got to ask yourself a question during this Samsung Gear 2 review – is it wearable? Well? Is it punk? The Gear 2 has upped the style stakes over its predecessor, adding a classier edge to the previous generation's plastic finish that gives it a classic timepiece styling that's often neglected on smartwatches. The main housing of the watch is an all-metal affair with a finish that's reminiscent of the Pebble Steel. Gear guide: What Samsung smartwatch is right for you? Quality aside, it's not exactly innovative in design. The brushed steel is nice, the plastic strap is adequate – however you choose to customise it – and the clasp is secure. Glued into that 68g and, slightly chunky, 10mm thick frame is a pretty staggering, 1.63-inch, Super AMOLED screen with a 320 x 320 resolution. That's a pixel density of 278ppi, which for spec fans out there is impressive, but it's the rich colours that it can produce that really get the juices flowing. What's more, it's very responsive to the touch and shows off that Samsung Tizen OS beautifully. While many smartwatches – such as the excellent Pebble and Pebble Steel – are simply controllers for your smartphone, the Samsung Gear 2 is a mini-computer on your wrist that runs a host of apps and features that go beyond basic notifications. Yes, it'll tell you about SMS, phone calls, emails, Twitter, Facebook but beyond that, this wearable has other aspirations. It wants to be your fitness tracker and sleep monitor. It wants to be your remote control for music on the move and your TV at home. The notifications side of things is excellent. You can't read long messages, which is a bit of a bore, but that's really only a minor gripe. We love not having to dig out our smartphone every time we think we've felt something. We love never missing calls and alerts like we do without it and we even quite like answering the phone using the Gear 2's rather excellent speaker system when we're making a cup of tea or driving down the road. It's actually one of the best hands-free solutions we've used. At the other end of the scale, the S Voice concierge – that's Samsung's Siri, for those not in the know – is complete rubbish, and the WatchOn Remote is effective but gimmicky. One of the biggest conundrums is the 2MP camera that's built into the frame of the Samsung watch. The low resolution makes it difficult to take worthwhile snaps, and its very presence jacks up the price £70 over the Gear 2 Neo. Surprisingly, however, we found its worth. When you're out for a run and can't easily access your smartphone, the watch-based camera is a great way to take snaps of sights on your route. They also pair to your Galaxy smartphone seamlessly, it's just a shame there's no way to share from the watch as well. However, in the main it's preferable to use your smartphone instead. Activity and sports tracking isn't too bad at all for something that classes itself as a smart – rather than sports – watch, and that's largely down to that built-in optical heart-rate monitor which each of the 2014 Samsung Gear wearables possess. That means that the Gear 2 knows exactly how hard to push you and when you're on the verge of a coronary without you having to either purchase or wear a separate chest strap accessory. The downside is that the readings aren't quite so good through the back of your wrist and the data isn't all that reliable. What's worse is that the S Health platform - where all the info is collated, presented and acted upon – isn't much cop either. The limitations to the measurable exercises are walking, hiking, running and cycling. There's nothing in there for fans of the gym, yoga, swimming or any racket sports at. Should you be interested in training for those four disciplines, however, then the Gear 2 system will let you set goals according to the time you take, the distance you travel and even how many calories you've burned. Do bear in mind, though, that none of these measures are bang on because there's no GPS sensor in the device. It's all about information from the accelerometer and internal gyroscopes; and we found it to be slightly generous when reporting distances. Of course, there is also a pedometer built in which counts your steps up to that glorious 10,000 per day that some unidentified medical professional decided is what us humans need – and has been ubiquitously backed by every wearable maker. Again, it senses arm waggles more than actual steps but it's accurate enough for the purpose. When it's time for the Sandman to visit, you'll have to tell the Gear 2 that you're going to sleep, and then again when you've woken up again. In the interim, all the Gear 2 does is pay attention to how much you toss and turn in the night according to readings from the accelerometer sensor inside. You won't discover how much you're dreaming or how deep your sleep is. What you will get, though, are some graphical representations of how much you kip and how peaceful it is when you do. There's no advice on what you should change either. If you haven't managed to read between the lines yet – sleep tracking on the Samsung Gear 2 is not something we'd recommend bothering with. There are some third party apps for the Gear's Tizen OS that you can download and plug all this sleep data into, the best of which is probably Sleep Genius. The idea is that it senses when it's time to wake you to feel at your most refreshed. All the same, we're not convinced that the Gear 2 pulls enough information for that to be done with any real credibility. If you're serious about sleep tracking, then try out the Basis B1 smartwatch. The Samsung Gear Manager app is one of the better features of this smartwatch system. It's an entirely seamless way for you to set up and customise your wearable without having to tinker too much with its small screen. Instead, there are generous smartphone-sized menus to sweep your fingers through. You can choose wallpapers and watch faces, tailor you notifications so that your wrist buzzes to only those pieces of information to which you're interested and you can download what good third party apps there are for Gear (clue: there aren't many). Everything you select on the Gear Manager app is beamed over to your watch almost instantaneously. The other feature of note is Find My Gear. There's a corresponding one called Find My Phone on the watch. The quick-minded among you will have figured out what they do - ok, let's be honest, only the dullards won't have. Hit the button on either and the other one will begin to light up and chirp until you can locate it. It's actually very handy, although it does rely on being within Bluetooth range. Lastly on the software front is the S Health app. You've got one on the Gear and one on your Samsung phone. The plan is that they talk nicely to each other to compile a tidy and accurate graphical picture of your activities. In reality, they don't quite. The reading on your steps from one rarely matches that of the other. It all just about works but you're not left with the feeling that S Health is as good as other fitness platforms out there. There are two things you should know about the battery on the Gear 2. Firstly, this smartwatch will give you about three days, maybe even nearly four days, of use on a single charge. That's quite good. There's that bright AMOLED screen to power and lots of features. If you go for a smartwatch with fewer tricks like the Cogito Pop, then you can really put that battery life up to weeks and beyond, but what you get here is about right. You don't need to charge it up every night; just some. The reason that comes as a relief is because you need a little plastic adapter to plug the micro USB cable into. You really don't want to lose that, so it's nice not to have to take it away with you for the weekend because you'll end up misplacing it. The slight bummer that we found, however, is not the battery life on the watch but on your Samsung smartphone. You need to have Bluetooth on at all times in order to connect to the Gear and, for us, that just shortened our phone's power to the point where it wouldn't quite last a day on a single charge, and that's not fun. We thought we were past that kind of thing in 2014. It's good to wear and handy for notifications but that better build and trinket of a camera come at too much of an extra cost for us to recommend it over the Gear 2 Neo. We like this smartwatch but it still doesn't feel like an essential part of our routine. 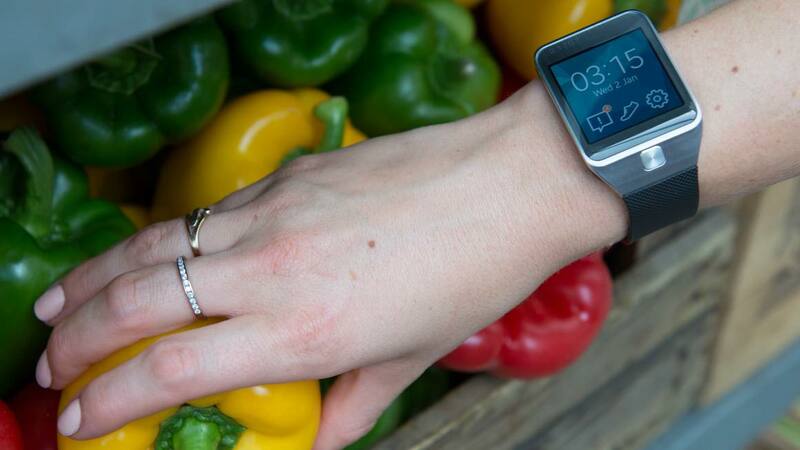 For this generation of Samsung wearables, we're happy to make do without.